It's been really cold here lately and I've been sick so I have been doing a little tying over the holidays. 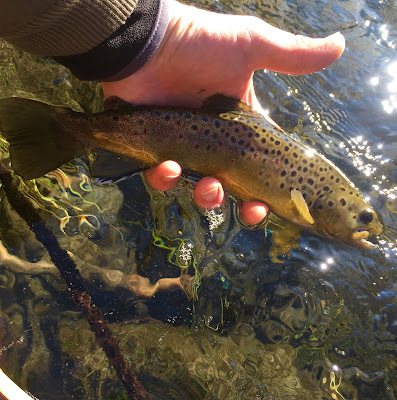 I was looking for some small but heavy nymphs that I could fish with my Euro rig in the late fall and winter when the nymphs tend to be small. I ran across some Spanish style nymphs called perdigons. These little "pellets" (perdigon in Spanish) are nothing more than an over sized tungsten bead, thread, and UV resin and the are quite dense for their size. 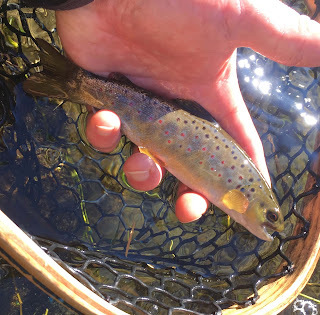 I've been fishing these a little this past fall and found them to good in situations where you want to fish a small nymph deep. Here are some variations I've been experimenting with. This last one is a little experimental where I tried to use midge flash as the hot spot. If you have any suggestions for a name you can include it in the comments. Tuesday was my last opportunity to fish in PA in 2017. It’s been fun fishing the Yellow Breeches this past spring and fall. 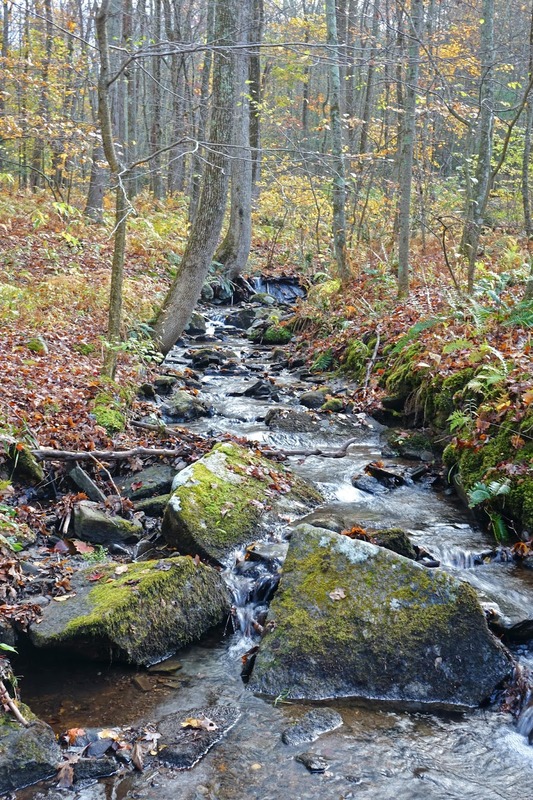 The Yellow Breeches isn’t a true spring creek but rather a hybrid between a classic PA limestone stream and a freestone stream. Nevertheless it is a bit different from the New England freestone streams I’m familiar and has offered me a chance to broaden my fly fishing experience. I’ve had a lot of help learning this stream from the local TCO shop in Boiling Springs, Brad Bashore and other PA fly fishermen I’ve met while fishing Yellow Breeches. Fishing “the run” in Boiling Springs has certainly pushed me to become more proficient at fishing small flies. I fished tiny tungsten bead head nymphs (#18 and #20) under a small indicator using my 6’6” fiberglass rod with a short furled leader and about 3 feet of 5X fluorocarbon tippet. This system seemed to work well and was a big improvement over the tight line rigs I had been messing with on my previous visits. The first brown in the net took a small rainbow warrior in a gentle riffle with a little depth to it. I continued to fish this run and had another take the small red zebra midge but I didn’t get a solid hook set. While fishing I struck up a conversation with a very friendly older gentlemen who was watching me. I recognized him from my previous visits. He had fished this area for many years and was full of information. 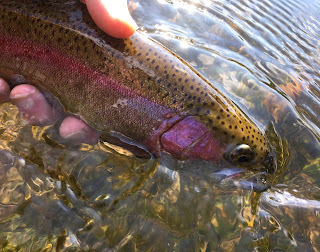 Encouraged by our conversation, I went up the to run that noticed him fishing on previous visits and briefly connected with a rainbow sitting in front of a rock at the tail of the riffle. 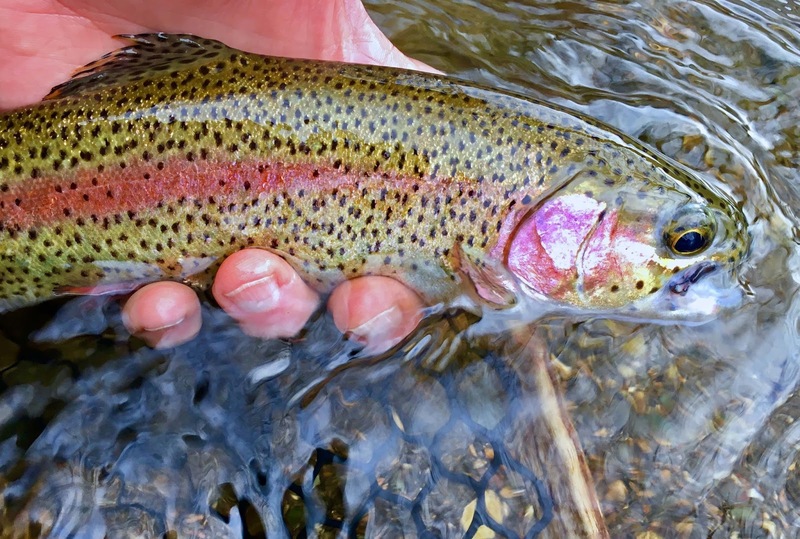 I worked up the riffle and found another rainbow. Neither fish was holding in water that I would have thought would hold fish in December but in this spring fed section the warmer water must keep the fish a little more active than in a typical freestone in winter. I finished the afternoon back where I started and stuck with the double nymph rig. I ended up using a slightly bigger rainbow warrior for the added weight to get the flies down and it seemed to pay off. 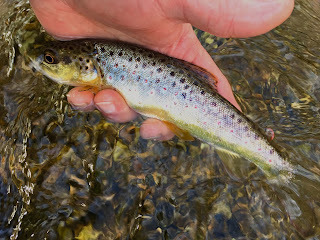 I found three little wild browns and a stocked brown that took either the larger rainbow warrior or the red zebra midge. At this point I decided to play around with a #16 frenchie perdigon . 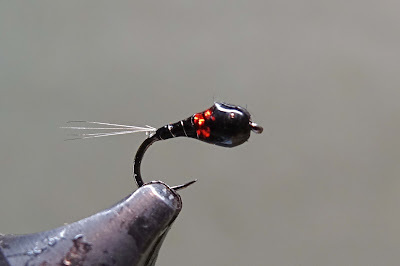 Many of you may not be familiar with this Spanish style nymph which uses thread and UV resin to create a small, dense fly with the ability to sink fast. I first saw this pattern on The Flow - Fly Fishing Blog and tied a few variations for those situations where a small fly was needed but one that would sink fast and this seemed like an ideal spot to give it a try. I was pleased to see that a wild PA brown agreed. I suggest you check out the link if you want more info on this particular fly. That red adipose says "wild"
The days are certainly getting colder now. As I write, we are getting our first accumulating snow in CT this season. 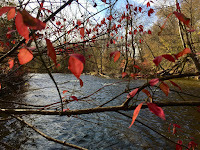 I love fishing the colder, gray days of late fall and early winter. The spring and summer are full of better days for catching fish, but you can't beat the calm and solitude of an early winter day. But in order to enjoy these days you have to dress with plenty of layers to stay warm. I enjoy getting a large cup of coffee in the morning and putting 2/3 of it in my thermos to have for breaks when driving between spots. I can put coffee in my little 16 oz thermos at 7am and it's still very hot at 4pm (I will have to post an equipment review on it)! A chemical hand warmer in the wader chest pocket keeps the hands warm and with less anglers on the river, I can walk around a lot and cover lots of ground which helps keep the feet warm. Except for a brief break throwing small flies to fish rising well beyond reach, I fished nymphs. I didn't catch a lot of fish but the ones I did find were on the larger side. 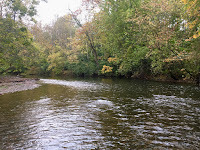 I started late morning in an area that fishes well for me in late fall. After working a caddis pupa and an foam egg with a small spit shot in front of the egg without any fish, I switched to a frenchie and a zebra midge and started working back upstream to where I started. About midway up the run, the sighter stopped and I could feel the heavy but gentle throb of a nice fish holding tight to the bottom. I stayed patient and remained downstream as the standoff took place in about a foot and a half of water. It felt like the fish was attached to the bottom with suction cups and when I got my first decent look, I could see it was a large, dark brown. I managed to get it close but made the fatal error of trying to pull it upstream to slide the net under it. The 5x gave way at the fly and off went a beast of a brown. I don't honestly know how big it was but it looked like it would have been my best fish of the year. 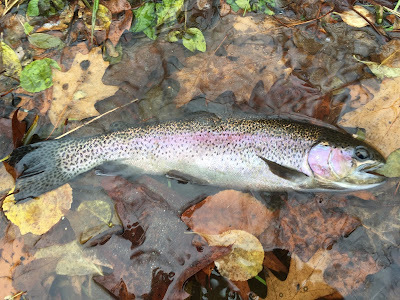 I continued working my way back and found a decent rainbow so at least I had one in the net. I changed the rig again and worked my way back down but didn't connect with any fish so I hiked back to the truck for some hot coffee and something to eat. I tried a few more spots in the afternoon without any success but I had one last section that I wanted to try before the end of the day. It was a cloudy day so by late afternoon the light was fading and the air was getting colder. 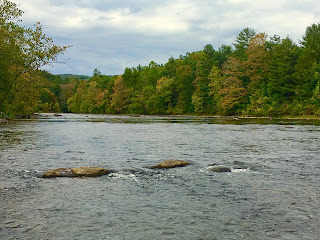 I managed to cross the river without getting wet and fished an area I had explored for the first time this past summer. I had a hunch that there might be a fish or two holding in the slower, deeper runs. As I approached the section I could see clearly the run I had noticed this past summer and it wasn't long before I was tight to another hefty fish that took the anchor fly (frenchie). This one was a male rainbow that was quite dark and very heavy. I stayed patient and downstream trying to keep side pressure on the fish. 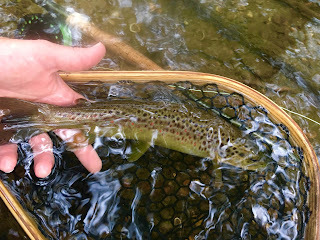 As with the brown, I was fighting this fish in shallow water that was moving a little more quickly than the softer water were I had hooked it so I needed to be careful to not to let the fish get downstream of me. With some patience I managed to get the fish in the net. At that point, I called it a day and made my way back across the river thankful to have spent the day outside finding a couple of quality fish. As we come away from the Thanksgiving holiday, I was particularly thankful this year that my wife and I could spend the holiday with our two daughters and son-in-law. We spend much of the year apart, so a few days together was such a blessing. On Sunday afternoon it was time to drive my youngest back to school to finish up the semester. Before returning home, I spent a couple hours on the Yellow Breeches in PA. It was a great opportunity to be outside on warm, bright, sunny, November morning. 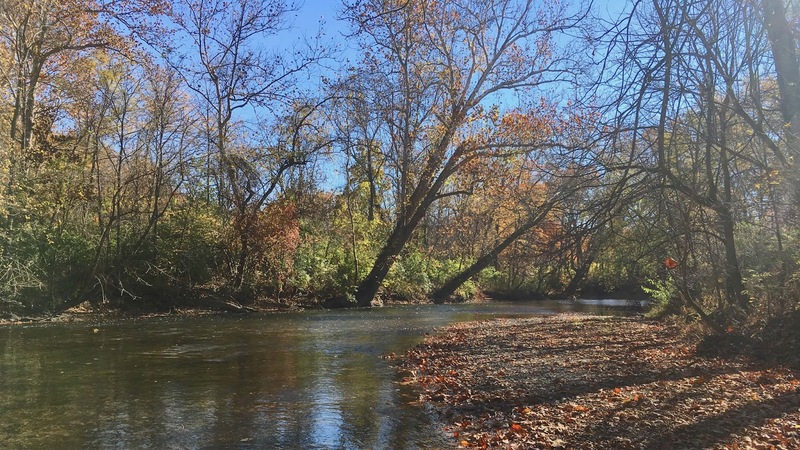 When the weather starts to turn colder and the days grow shorter, the solitude of normally busy streams and rivers can be something very enjoyable, especially one days like these. From my experience a week earlier on "the Run", I decided to try my 6’6” fiberglass rod and shorten up my leader. I started off the morning fishing small eggs to a group of trout holding in the shallow tail out of a gentle riffle. 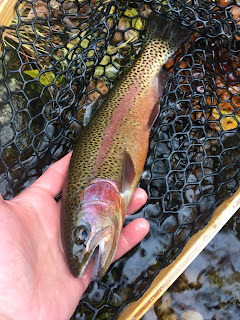 I don’t often sight fish to trout but in the crystal clear, shallow water I could easily see and observe several trout. I started off with a small zebra midge and a small foam egg. As I watched the egg tumbling through the water, occasionally a fish would follow the egg but mostly it was being ignored. I placed a small spit shot about 10-12 inches above the egg to see if I could keep it closer to the bottom and slow it down. After making several adjustments to the drift, I managed to pick up the first brown of the morning. I tried half a dozen small nymphs as a dropper but the trout weren't interested. 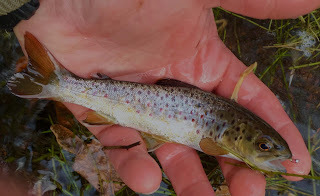 After being satisfied that I had worked the riffle thoroughly, I switched colors on the egg and managed one more brown. I took a little break to talk with another angler who had done very well with scuds in another spot. After our conversation, I decided to move on to some deeper, faster moving water. 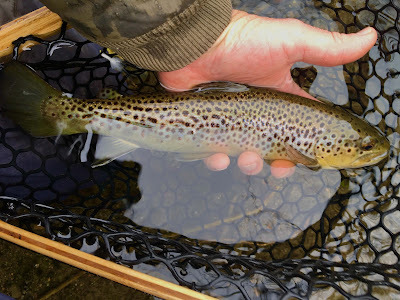 I added another split shot and fished the egg/zebra midge combination and found three more browns that were looking for eggs as well as some brief tangles with trout that took a variety of cress bugs and pheasant tails of various sizes. After spending most of the morning thoroughly enjoying myself, it was time to start on the drive home but it was a shame to leave on such a gorgeous day. Days like this one aren't that common in late November, so I was especially thankful to have the opportunity to fish over fussy PA browns and have some success. The shorter rod and leader definitely made the fishing easier and more enjoyable. It was time to pick up my daughter from college for Thanksgiving break which gave me an excuse to fish the Yellow Breeches in PA again. The morning started bright and sunny and the air quickly warmed. Soon the air was filled with small clouds of midges and small olives. 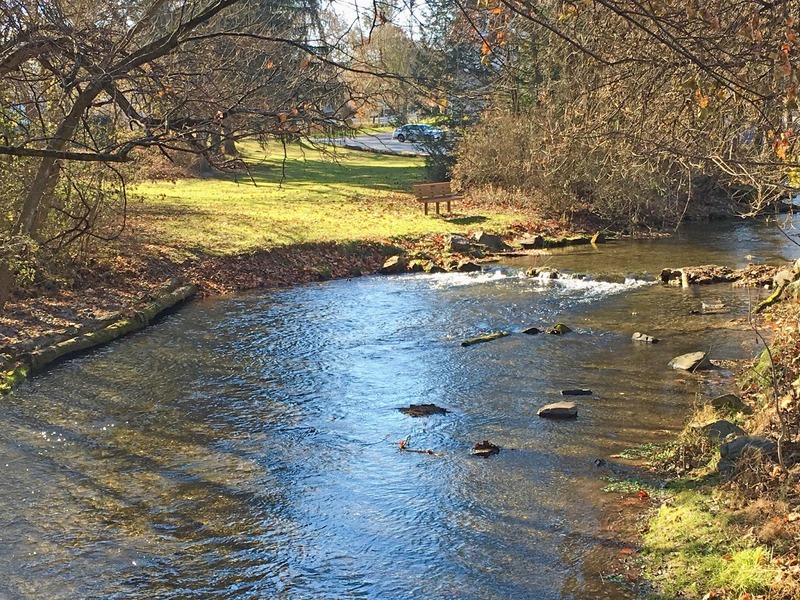 I decided to fish in Boiling Springs along "the run". 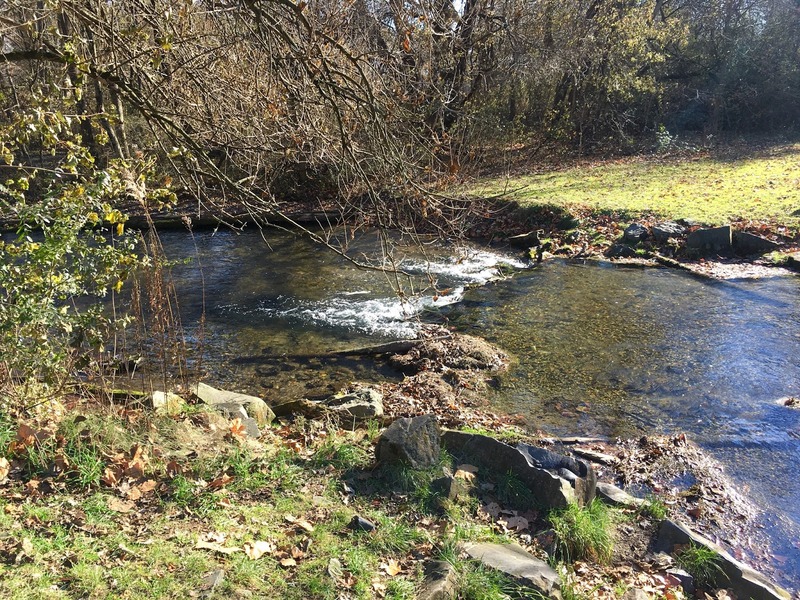 If you like small streams, the run is one of the most challenging small streams I've fished. 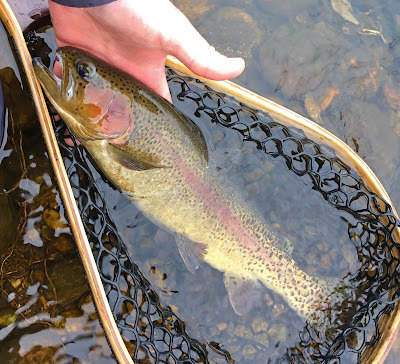 The run is small and tight and the water is very clear and shallow making it tough to approach the shallow riffles and tail outs where the fish are holding without sending the fish rocketing for cover. I fished most of the morning with small nymphs and foam eggs and found a number of very pretty browns. 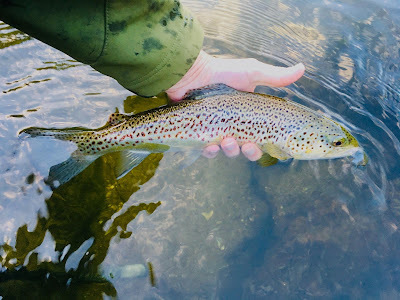 I did well in the heavier runs where I could approach without alarming the fish but it in shallow runs and riffles I still spooked quite a few fish. The next time I visit, I have some more adjustments to the leader in mind so that I can effectively fish small nymphs from farther away. Have a wonderful Thanksgiving everyone and thanks for following along! It seems like this fall has just flown by! It wasn't that long ago that we experiencing warm days and lots of fall color and now we are midway through November and the winds of winter are starting to stir once again. 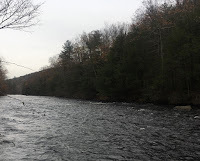 I spent a cool, overcast day on the Farmington River this past week. About mid-day some steady snow showers enveloped the river and the surrounding hills. 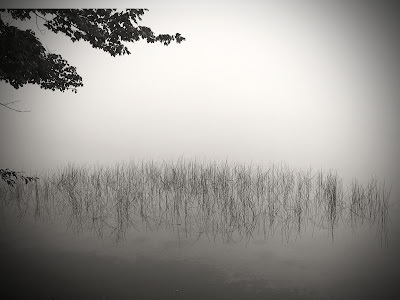 Between the overcast skies, leaves that are mostly off the trees now, and the falling snow, there was a very grey solemn cast to the day that only enhanced the solitude that was to be my experience this particular day. I fished a number of spots and only saw one other angler all day. The first cast I made connected with one of the prettiest rainbow trout I've caught in the river this year. From the orange belly, I am tempted to think that this was a fall spawning stocked rainbow. I am told this does occur in some stocked rainbows. I am never overly excited by hooking up on the first cast since past experience usually indicates that the fishing will be slow for the rest of the day! Not only did I connect on the first cast but the rainbow took a Lafontain deep pupa that I was using as a dropper. I've fished this fly on a number of occasions and I have rarely caught fish on it. I don't really know why I put it on other than it was fall and there were caddis around earlier. I know plenty of people that fish this fly often and do well with it, just not me until today. After thoroughly working the first location over pretty well, I moved on to 4 other locations without a bump. My fifth stop was a section of the river that I explored for the first time this past summer. 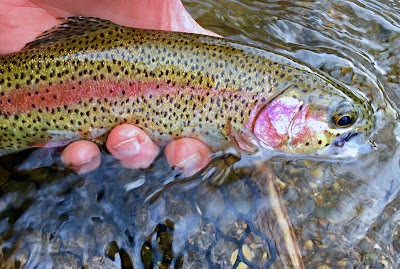 Again within a few casts I had another nice rainbow again on the Lafontain caddis! I guess the rainbows were just looking for caddis pupa! I will have a few more in my box the next time I am out! 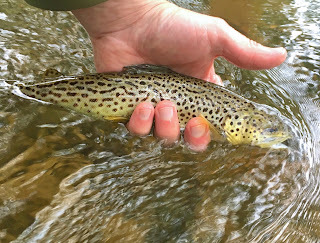 I continued to work this section and found a good sized brown willing to take a foam egg that I was trailing behind the anchor nymph that I was using to keep the flies close to the bottom. The brown was was missing a nice chunk of it's tail that I guess was the result of tangling with something a bit bigger with a round jaw. I continued to fish hard for the rest of the afternoon without any more hookups. Even though the fishing was slow, it was a rare pleasure to be out and enjoy the river all to myself with the snow and grey skies filling the landscape with subdued overtones that made the day especially enjoyable. I am sure those of you who have spent a lot of time outdoors understand and have had similar experiences. One of the many joys of small stream fishing is the fact that most fish in these small streams are wild fish. While small headwater streams don’t hold large fish, the ability to observe the stunning beauty of these wild fish is the reason some of us are drawn to this endeavor. This is especially true in the fall when the brook and brown trout begin to take on their characteristic pre-spawn coloration and the New England woodlands echos these changes with the distinctive yellows, oranges and reds of a hardwood forest in seasonal transition. Recent rains were reminding me of the simple pleasure of small stream fishing in the fall and had me looking for an opportunity to get out again. 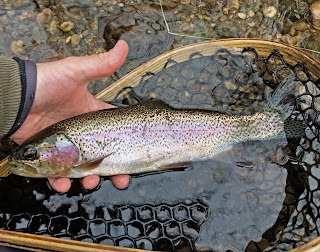 Visiting a favorite small stream, I was pleased to see that it was full and flowing at a level that reminded me more of spring than fall and I wondered if fishing a dry fly was the right choice. Despite my doubts, I was content to fish a dry fly all morning long along the riffles and glides. 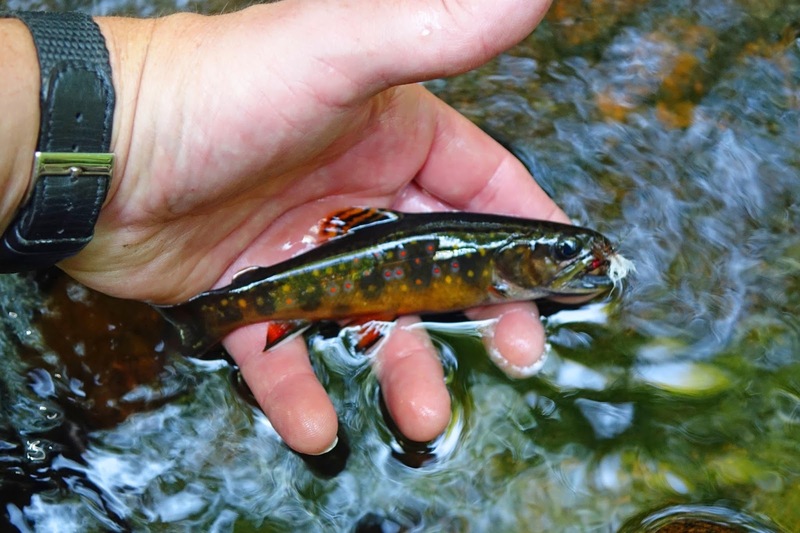 Several small yearling brook trout were interested in the elk hair caddis but nothing larger. 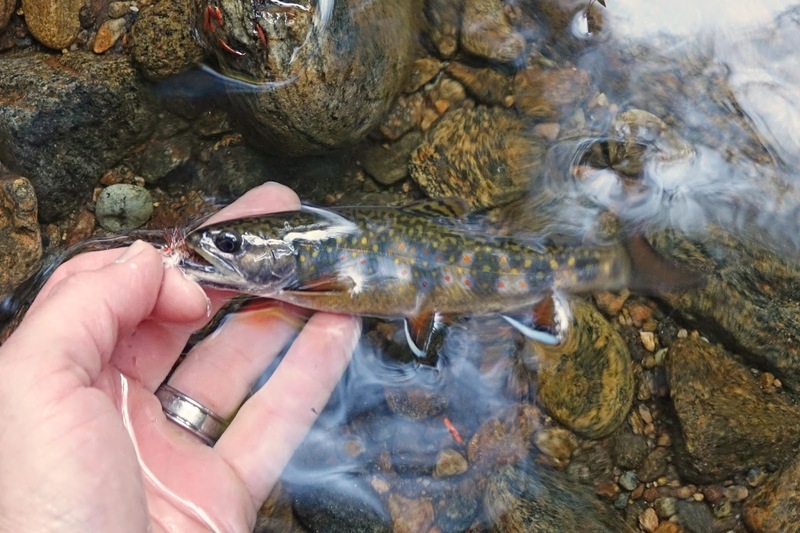 Approaching a stump along the stream's edge, I drifted the dry in a small seam just alongside the stump's edge and saw a nice brook trout rise to inspect the fly. I generally don't see small stream brook trout refuse a fly, so I tried again trying to get more natural drift and again the fish rose, put's it's nose right under the fly, and then descended, disappearing once again into the cover that the stream bottom provided. At this point I was convinced that a fly change was in order. Looking through my box, I pulled out a small parachute Adams that I often fish in the fall and drifted it through the same seam. 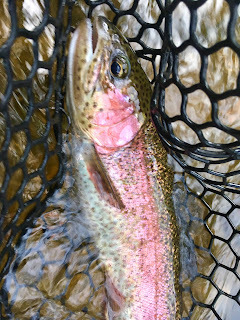 The first drift failed to produce a response but the second brought the trout up from it's hiding spot and it took the Adams. 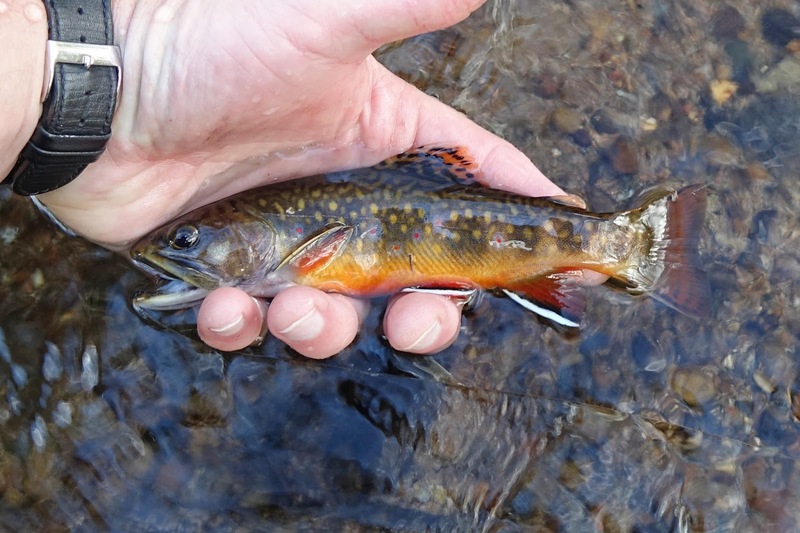 After a brief battle, I was soon admiring the bright orange belly and dark throat of a gorgeous native brook trout. I continued to fish the Adams and found a few willing to take the dry fly, most however were willing to only take a swipe or two. In the last run fished this particular morning, I also found a beautiful little wild brown. 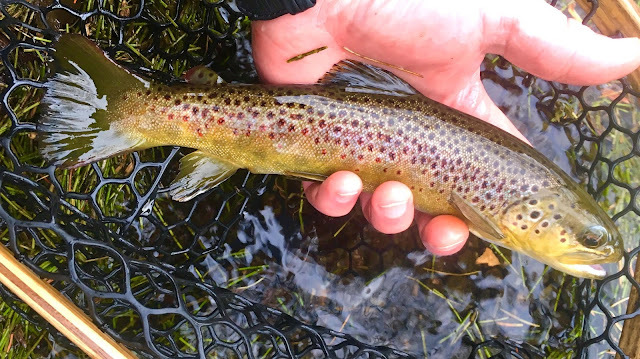 I rarely find a wild brown as far upstream as I was, but it was a very fitting end to a fall morning out chasing wild trout and enjoying all the sights, sounds, and smells of a fall morning in New England. I was back in PA the end of last week and early this week and had the opportunity to spend a couple hours on two mornings on the Yellow Breeches. Last week, the recent rains had brought the river up a touch and it was off-color but not muddy. The morning I was out there was a light rain but nothing too heavy. 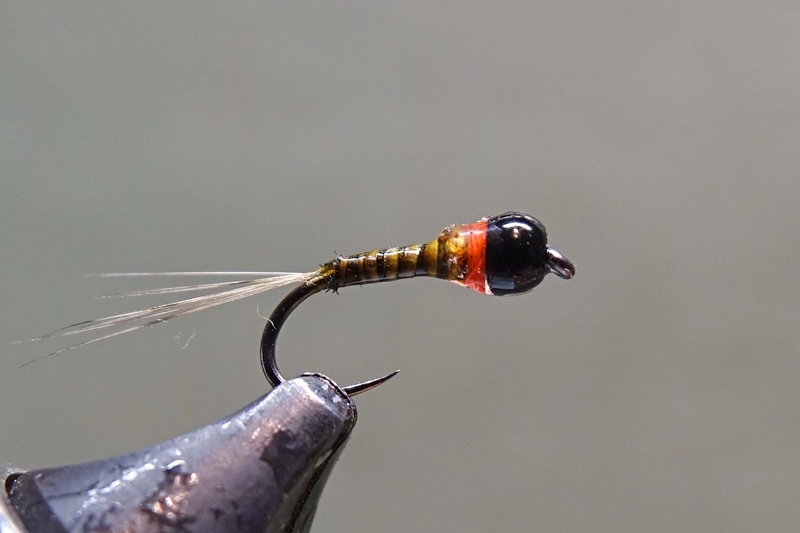 I started out nymphing a soft-hackled pheasant tail that had worked well a couple of weeks earlier when the river was low and clear. This particular morning the PT was not attracting any fish, I suspect because of the lower clarity of the river. I figure something with a bright hot spot might be a better choice so I switched to a frenchie of about the same size with a pink ice-dub collar and stuck with that the rest of the morning. 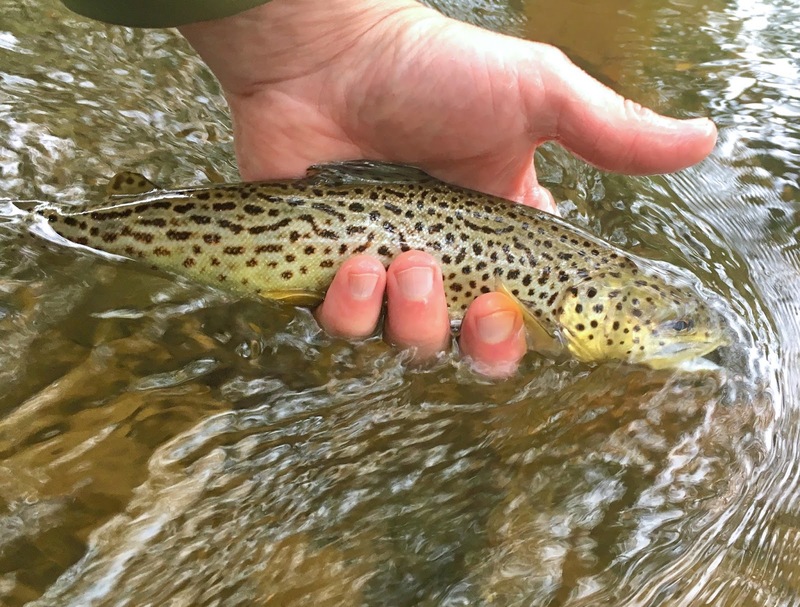 The first fish of the day was a gorgeous wild brown with beautiful golden belly and well defined red spots, red flair on the adipose fin and bright red rays in the tail, all indicative of a stream-born brown. Unfortunately in my desire to keep the fish in the water, it managed to take off before I could get a picture. I found another downstream but it slipped the hook right before the net. 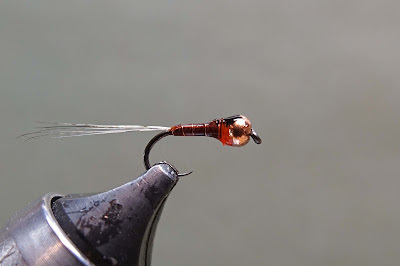 While I stuck with the frenchie as the point fly of the two nymph rig I like to use, I did experiment with various droppers. 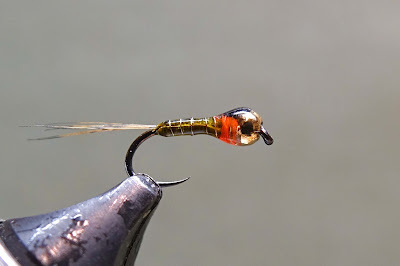 I was convinced that a caddis puppa in the right size and color would interest a fish or two but regardless of the dropper, all the fish took the frenchie. The odd thing with the Breeches is that I can't remember ever catching anything on a dropper where at home in NE I catch almost half of the fish brought to the net on the smaller dropper. 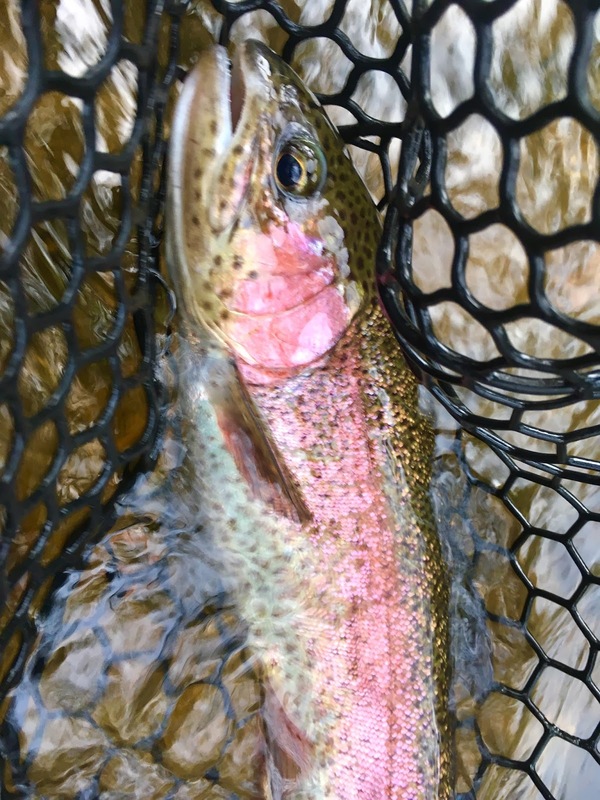 For a couple hours the browns seemed to be the most active but I did catch a couple of colorful rainbows similar to those I found on the last trip. In fact, I am certain that the first rainbow of the day was one I had caught back in mid-September. It was sitting in the exactly where I found it previously, right up against a sycamore tree. I was a little concerned whether I would be able to stay dry since I had left my rain jacket at home but the rain was fairly light and the gray overcast drizzly morning was delightful in the way the gray drizzly mornings often are. Then this week, I explored another section of the Yellow Breeches. The river was clearer than I was expecting. The frenchie was not working in the greater water clarity so switched on a more natural caddis and zebra midge. I did manage a couple of stocked browns and one beast of a fall fish. There were sporadic rises all around me making me wonder how I would have done fishing a small olive dry fly. I spent a recent afternoon out enjoying the Indian summer weather we've been experiencing. It's been a pretty dry fall so far and the rivers are low but remaining cool. 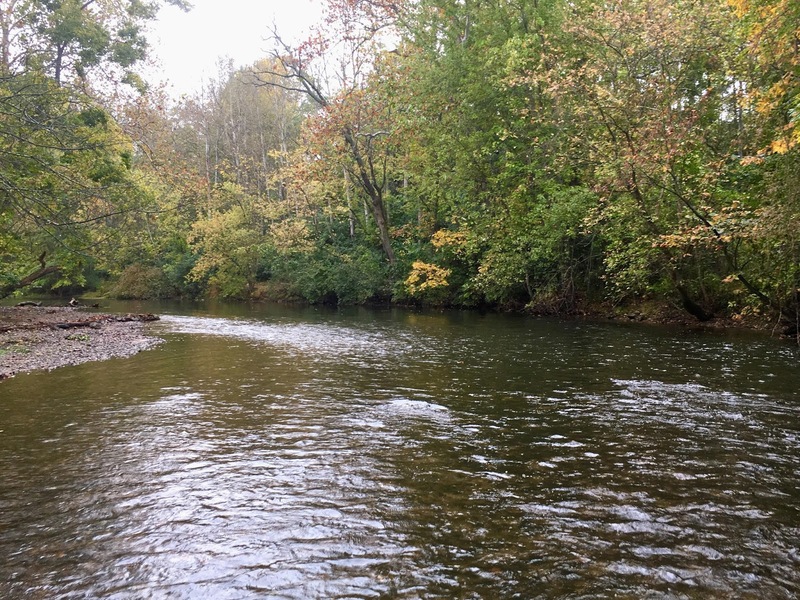 With the lower water, I took the opportunity to explore some sections of the river that are normally not accessible to wading under normal conditions thinking that fish might have moved into runs with a decent flow and some depth. Approaching the first promising run, it took about three drifts before the first brown was in the net. As I was bring the fish to the net, I noticed that I was being watched. Not wanted to be tangling with hungry heron, I quickly released the brown into some deeper water nearby and moved on. I spent the rest of the afternoon picking my way among the boulder strewn stream bed with only a couple of taps to show for my efforts. After working my way back, I decided to move to a run/pool that I haven't fished since last fall to see what the evening would bring. Late in the afternoon, I noticed some subtle rises in the tail of a long riffle. I had seen some olives appearing as the clouds began to dominate the sky. After experimenting with the best position in which to get a decent drift among the conflicting currents, the #22 olive CDC emerger drew the first strike but I only managed to briefly hook the fish. This pattern repeated itself twice more before the subtle dimpled rises ceased. Then what I believe were little yellow quill spinners (Leucrocuta hebe) started appearing in number over the water surface and fish began rising again. As I've seen before the fish were actually taking the spinners in the air rather than off the water's surface and it can be a very frustrating experience and this evening was no different. I did managed to fool one brown with a small comparadun but that was it. I tried every pale spinner, parachute and comparadun I had with me but nothing drew any interest. So I've spent the last couple days doing a little research to figure out what I was seeing and collecting some ideas to go back to the tying bench. 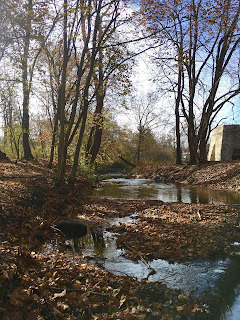 I was visiting my youngest at college a couple weeks ago and had a couple hours in the afternoon to fish a little bit along the Yellow Breeches. 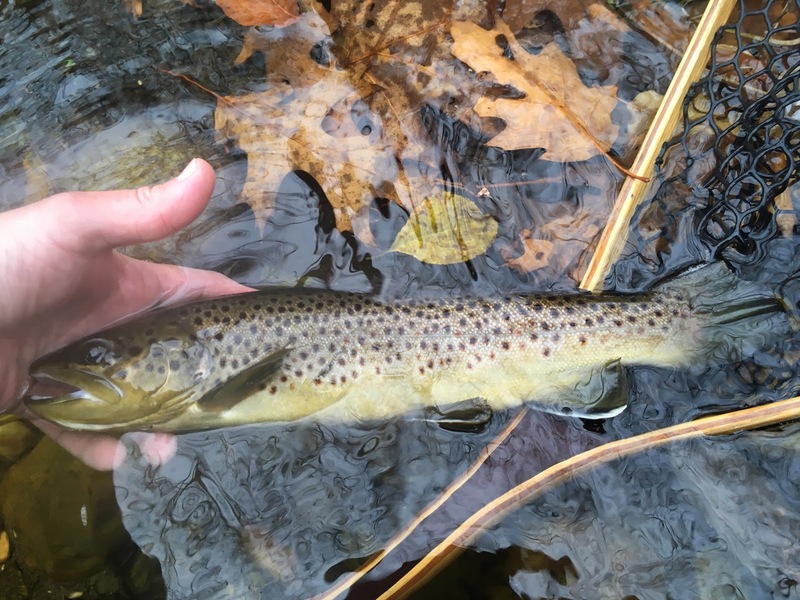 Having fished mostly New England freestone streams it's always an interesting experience to fish a limestone stream in PA. 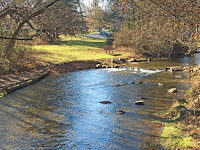 While I grew up in PA and started fishing there as a young boy, I don't recall fishing any limestone streams as a boy. My first limestone experience was last fall visiting my daughter in her first year at college. One of the first things I noticed on the few limestone streams I've fished is the stream bottom which is mostly very fine gravel and what appears to be ground up shells. 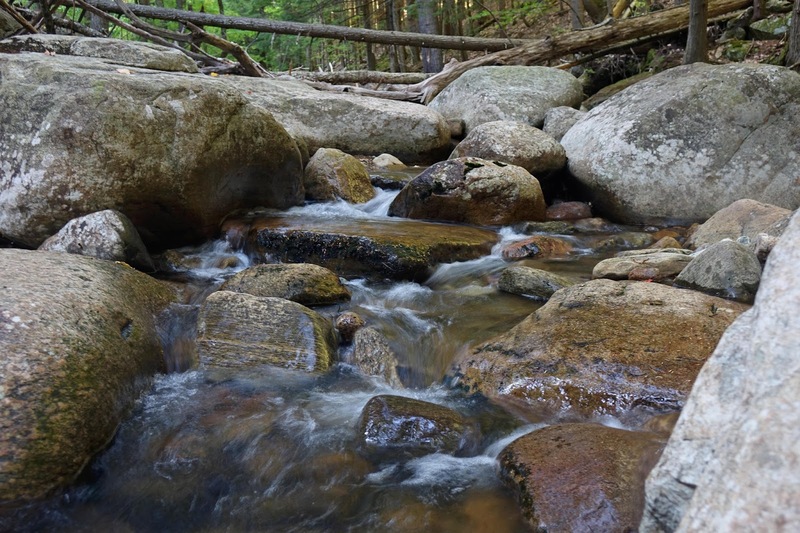 The boulders and pocket water typical of a freestone stream are replaced with a gentle but steady current bank to bank with little pocket water to speak of. Sometimes the fish will be holding in the gentlest of depressions in the bottom often in the gravel channels between weed growth. With each visit, new observations are made and experience grows. For whatever reason, the fish I catch in the Yellow Breeches take a bead head pheasant tail soft hackle even though this stream is loaded with caddis. Last spring I was amazed at the number of caddis cases I was finding along the river bottom. One particular spot where a nice current runs up along the roots of an old sycamore tree I've managed to find a fish or two each time I've fished this particular section. This afternoon it seemed no one was home until I put the pheasant tail on point and used a zebra midge as the dropper and ran the flies a little closer to the roots. 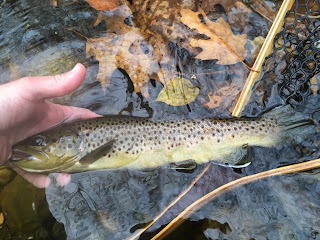 I was pleased to find a pretty little wild brown. 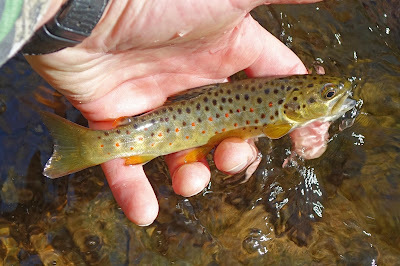 I love finding these wild browns wherever I fish as they signal healthy rivers able sustain trout. I was reasonably sure there was a large fish around those roots somewhere soI tried to put the flies as close tree as I could and I saw a nice rainbow take the pheasant tail inches from the where the tree met the water. I messed around with various droppers over the course of a couple hours but it really didn't matter as all the fish took the pheasant tail. 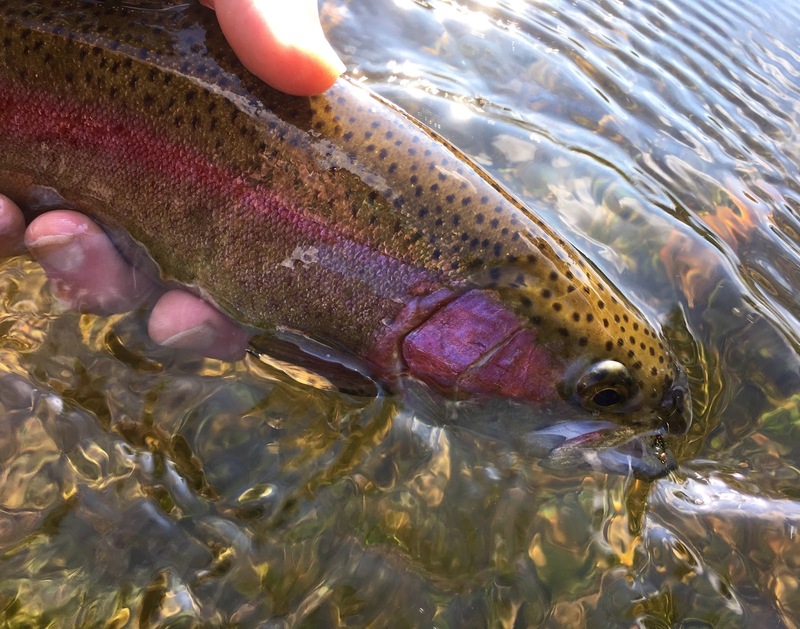 Once I re-familiarized myself with paying closer attention to the smaller depressions I was able to bring to net a handful of nice rainbows. One couldn't but notice how red their flanks had gotten and how dark these fish were across the back. Have a look for yourself and feel free to comment if you think this is a strain of rainbows common to PA or whether these fish might be unique to the Yellow Breeches. I will say that all the fish had well developed, rose colored fins that isn't typical of the stocked fish I usually see. A couple weeks ago we had the chance to spend a couple days up in the Adirondacks. The mountains were starting to show signs of the approaching fall and despite the wet spring and summer this past fall has been reasonably dry in the mountains. 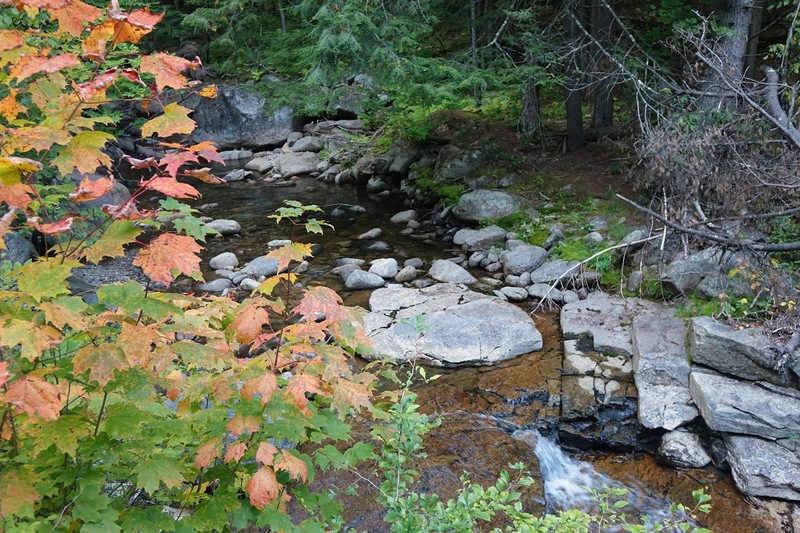 The mountains are especially quiet and beautiful in September which seems to heighten the sense of remoteness that one feels in the less traveled parts of the Adirondack Park. The families that vacation in the mountains in the summer are back to their regular routines and those who like to observe the fall foliage are still planning their travels. 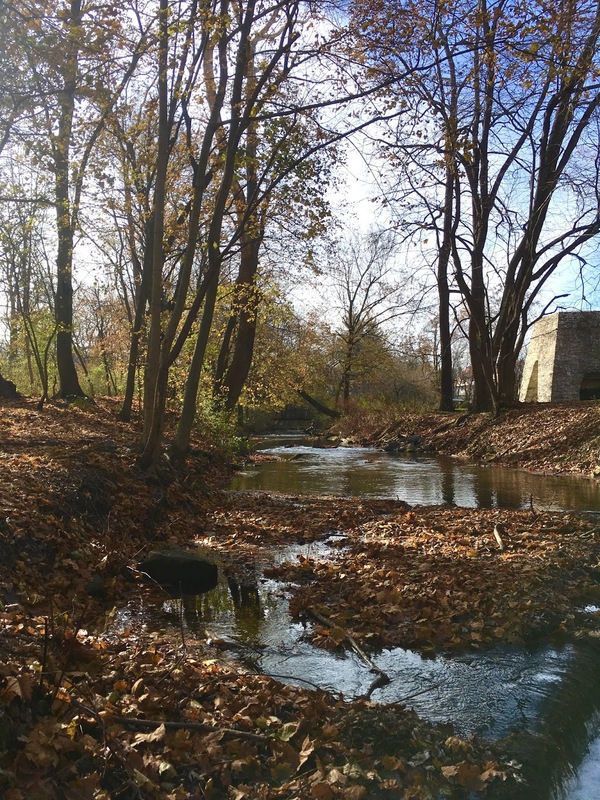 My wife and I enjoyed some fantastic weather for hiking and I fished a familiar small stream and did a little prospecting on a new stream. I have always wondered whether a particular small stream held brook trout but finally got a chance check it out. 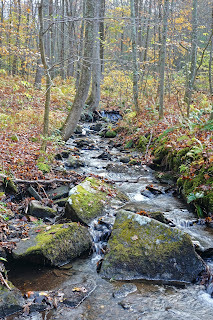 The stream had a nice flow of tanin-stained water with some deeper runs and pools that looked very promising. I found one deep, long pool with a nice flow of water at the head which probably would hold fish in the spring but on a clear September day the fish were likely tucked under a bank somewhere. I didn't spend a long time exploring but after drifting the Royal Wulff through a couple of promising areas, I did confirm that the stream is worth exploring further. It is always nice to see another stream where these native fish are still holding strong. 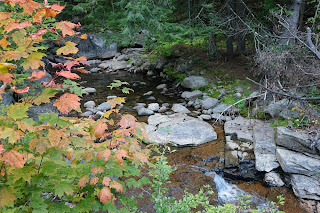 The next day, I fished a familiar stream and found fish willing to chase a foam ant, Royal Wulff, or Ausable Bomber. The fly didn't really matter much. The fish seemed to be hiding under the rocks along the banks. Most of the brook trout that were willing to show themselves were of the smaller variety but I did see more than a few dark shadows scurrying for cover in the low, clear water of early fall. It was fun to watch the brook trout dart from under a rock or bank to intercept a fly working it's way along the current. Even though our visit was brief I was so thankful to have the opportunity to enjoy the mountains at this wonderful time of year. Our final day in the mountains we decided to hike early and enjoy the view below before heading home. I have been out a couple times in the last few weeks taking advantage of the pre-fall like weather in both the Adirondacks and in southern New England. 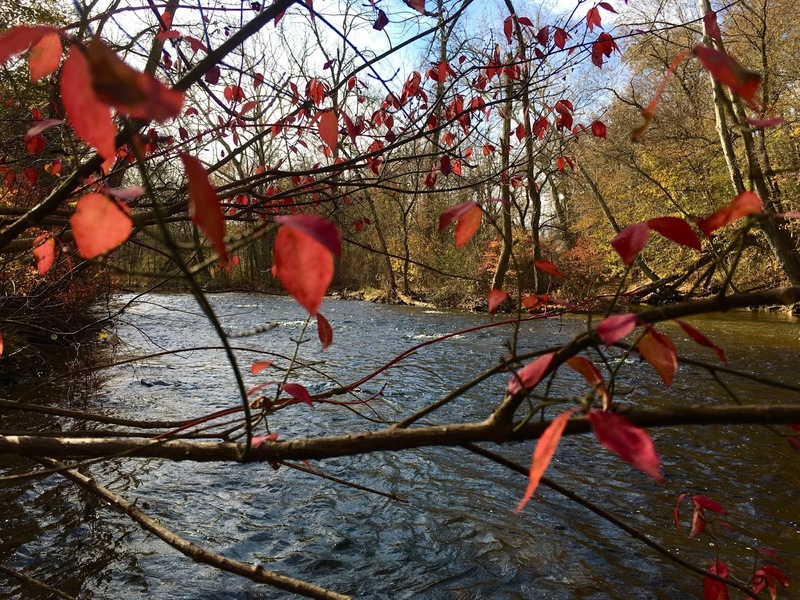 This is one of my favorite times of year for both fishing and hiking. So for a change of pace, I decided to head up to the Houstatonic river and see how it was fishing. I arrived late afternoon with hopes of casting dry flies large and small to rising fish. It took a while to get going but fish started rising as the afternoon turned toward evening. I did manage to observe one fish that was rising in the same general location so I settled in to figure out what this particular fish was feeding on. After drifting the isonychia emerger several times right over where I had observed the rises, I downsized to small olive dries and wets and went down in tippet size to 6x but still failed to attract any interest. At this point in the evening there were a good number of summer steno spinners hovering over the water. This is a scenerio I had seen before so I switched to a #16 pale parachute and got a decent drift and the fish was on it! It turned out to be a very healthy brown in excellent condition with all the fins intact, possibly a hold-over. I stuck with the parachute but didn't see any more rises but I did have a fish slam the parachute as I was pulling it back in to make another cast. It felt like a decent sized fish and it hit the fly so hard that it broke the fly off. I rested for a while and observed, searching for other fish rising in the area. Upstream a bit there was a father and daughter fishing over a group of steadily rising fish so I moved below them to watch and see if there were any fish that were outside of the area they were working, not wanting to crowd them. Both he and his daughter had caught a few fish, and I think the young lady may have caught here first trout on a dry fly, judging from her Dad's excitement while she was bringing it to the net. I just love seeing Dad's out with their children! 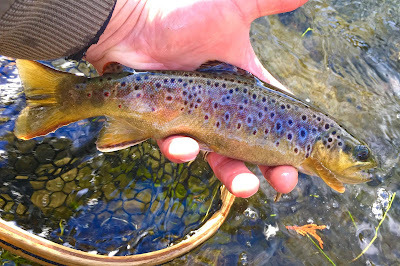 The rises had become more subtle which sometimes indicates that the fish are taking spinners so I switched to a #16 pale spinner and picked up a few more nice browns and a couple of rainbows. The highlight of the evening was when I overheard the father say to his daughter, "one more fly change and I'm done". He was clearly getting frustrated trying to figure out what the fish were sipping. I asked him if he had any #16 pale spinners and offered him one if he didn't. He said he had some spinners and within a few casts he had a beast of a brown on the line. He was able to get it to net with the help of his daughter and it was a pleasure to watch them take a few pictures, release the fish, and then head back to there car satisfied to have had a nice evening on the river together. Just a quick thank you to the Farmington River Anglers Association and Grady Allen for the invitation to speak last night about the Adirondacks and it's brook trout. It was great meeting some new folks and I enjoyed the good discussion that followed. If you are interested in me speaking to your group you can reach out to me via email.